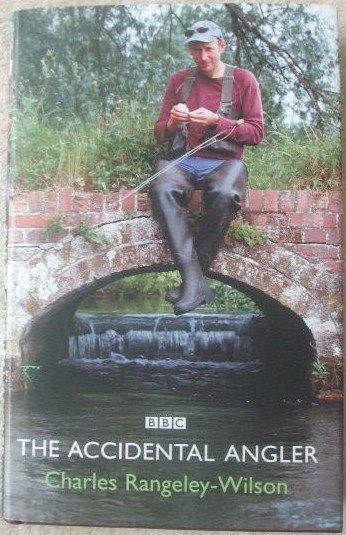 First edition, first print hardback of THE ACCIDENTAL ANGLER by Charles Rangeley-Wilson and published by Yellow Jersey Press/ Random House, London in 2006. Published with the permission of the BBC. With full numberline 2 4 6 8 10 9 7 5 3 1 on the copyright page. The book is in very good condition (Clean maroon cloth boards with silver lettering on spine), with minor shelf wear to the pictorial dust jacket which is price not clipped. Internally, the pages are clean and tight and there are no tears and no inscriptions. Charles Rangeley-Wilson is an award-winning journalist and broadcaster. As well as presenting BBC TV's The Accidental Angler, he is The Field's fishing correspondent and contributes regularly to Gray's Sporting Journal, America's leading literary outdoor magazine. He won the Periodical Publishers Association Specialist Writer of the Year Award for his work in The Field magazine. He was a founder of the Wild Trout Trust, and is the author of one previous book, Somewhere Else(2004) and his latest and Silt Road (2013). A broadcaster and film-maker he has written and presented for the BBC, including the critically acclaimed BBC4 film Fish! A Japanese Obsession and the BBC2 series The Accidental Angler. In 2006 The Angling Writers Association voted The Accidental Angler their Travel book of the Year and in 2011 the same organisation voted Rangeley-Wilson Travel Writer of the year and Arthur Oglesby Writer of the Year. In The Accidental Angler follow-up to the acclaimed Somewhere Else, come fifteen new fishing stories. It combines travel and culture with fishing adventures in India, Bhutan, Brazil and London. "Meet Charles Rangeley-Wilson. He's one of Britain's best-kept secrets - angler, conservationist, traveler. He's also one of our finest fishing writers. Now join him on a trip of a lifetime, on a journey that will make the familiar new, and the strange familiar. Published to accompany Charles's BBC TV series, The Accidental Angler takes us from London suburbs to Bhutan, Icelandic moonscapes to the Seychelles — in fact, anywhere a fishing rod leads. In The Accidental Angler you'll battle titanic monsters on a tropical atoll and make-believe sharks on the mushy-peas-and-gravy Wash. You'll chase inscrutable grayling through back gardens in Provence, or phantom sea trout in downtown Southampton. And you'll dance in Brazilian carvinals and find secret rivers hidden beneath the streets. Fishing can take you to the heart of a landscape in a way few other forms of travel can match. A fishing rod will break the ice with locals, guides, farmers, shopkeepers, taxi drivers, and barflies. Whether in the world's most outlandish and awe-inspiring places or just at the end of your road, fishing will introduce you to crabby weather and crabbier locals, moon-phases, rip-tides, floods, droughts, remarkable tales, and of course fantastic slippery beasts." 'Thrilling, made me writhe with envy' — Sunday Telegraph "
205 pages. Illustrated with colour photographs.